SGMF founding members Mitsui O.S.K. 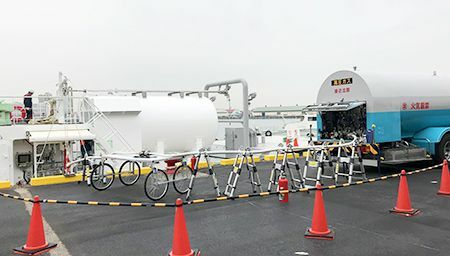 Lines announced that it's LNG fueled tugboat Ishin bunkered LNG fuel in Sakai Senboku Port for the first time, in preparation for test operation. 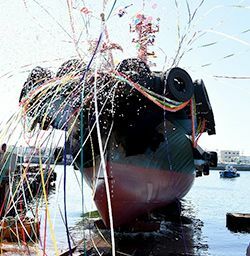 MOL ordered the vessel from Kanagawa Dockyard Co., Ltd. This is the first bunkering of LNG as a vessel fuel at any port in the Kansai region. The LNG fuel was supplied by Osaka Gas Co., Ltd. using a truck-to-ship LNG bunkering procedure. After test sailing with LNG fuel, the Ishin is slated for delivery in late February, and will start operation in April as the first LNG-fueled tugboat serving Osaka Bay. The Ishin will be operated by Nihon Tug-Boat Co., Ltd. Working closely with the Osaka Prefecture Port and Harbor Bureau and Osaka Gas, MOL has worked to develop an LNG fuel supply system for ships in Sakai Senboku Port, which will be the first in Osaka Bay, through development of the Ishin. The MOL Group continually contributes to widening the use of LNG fuel for ships and reducing their environmental impact by building upon the safe and efficient operation of the Ishin.